Fullerton Paint and Flooring offers the best value in Orange County for custom window treatments and coverings. Home and business owners throughout Fullerton, Anaheim, Yorba Linda, Brea, and surrounding areas can call us to arrange a free in-home consultation or visit our Anaheim showroom to browse the numerous window treatment options we have on display. We sell and install all types of blinds, including, mini blinds, honeycomb shades, pleated shades, PVS shutters, wood shutters, woven wood shades, vertical blinds, wood blinds, faux wood blinds, roller shades, and fabric shades, all made by reputable manufacturers, such as Hunter Douglas, Sundance, and Graber, as well as trusted local suppliers. 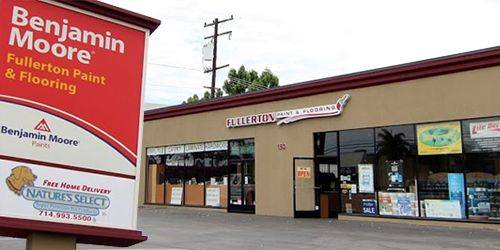 At Fullerton Paint & Flooring, we have window coverings to decorate any opening, including small round windows, floor-to-ceiling windows, patio doors, and bay windows. Whether you choose vertical or horizontal window blinds, plantation shutters, or Roman shades, you'll have an extensive selection of styles, designs, colors, and materials to choose from, from all-natural wood to luxurious sun-blocking or sheer fabrics. If you aren't sure which treatment is right for your window or exterior opening, our highly experienced, professional installers can help. In addition to providing helpful guidance, they also take expert measurements and follow the industry's best practices for installation to ensure that your window coverings fit and function perfectly. Call or visit Fullerton Paint and Flooring today for a free window treatment consultation. We've served the home improvement needs of thousands of satisfied customers throughout Fullerton, Anaheim, Yorba Linda, Placentia, Orange, Brea, and other Orange County cities since 1995 and have become known for offering reliable advice, competitive prices, and superior results.